Made By Cow milk comes from a single, Jersey herd located on the pristine South Coast of NSW. 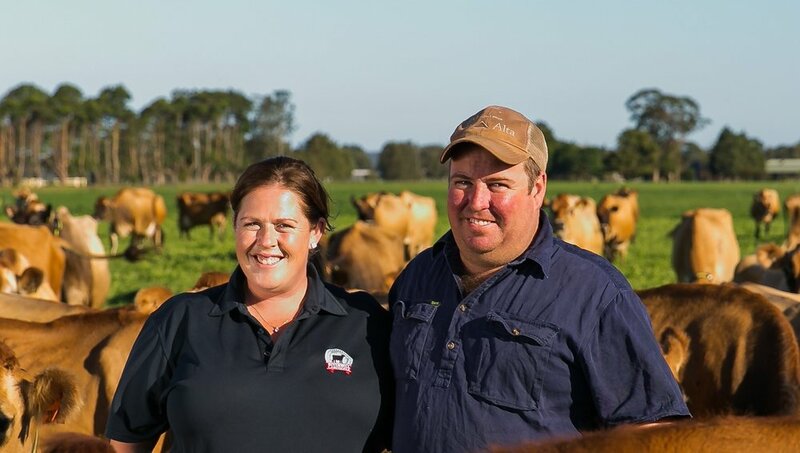 Our dairy farmers, Stewart and Hayley, live on the farm with their young boy, Fletcher, and lovingly tend to their cows like family. 3:20am alarm goes off and we head to the dairy. All the machines are hooked up and checked. Computers are switched on and the cow activity monitors are reviewed, this helps us assess the activity and health of all cows. 3:45am the cows begin to arrive in the yard and milking begins shortly after. We use a rotary to milk the cows, and as the cows walk onto the rotary a computer checks their ID. We have a specialised teat washer, which allows us to sterilise the cow teats by hand before the milkers are attached. As one cow finishes, another cow gets on the rotary, and this process continues until all the cows are milked. We have 600 cows in total. 6:00am we finish the milking and clean down the dairy. We then prepare bottles to feed the baby calves. 9:00am there are many other jobs that we need to do throughout the day, like filling up hay feeders, machinery maintenance, tractor work on the pastures and crops, shifting the young calves or re-bedding the babies. And there’s always office paperwork to be done too! 1:30pm after lunch we feed the calves again and tend to the pregnant cows. 2:30pm we prepare for the days second milk. The cows will arrive to the dairy at 3:00pm. 6:00pm once all the cows are milked and the machinery is cleaned, we head home for dinner. After dinner we always check the cow activity monitors in case a cow is calving.